The three main nuclear players of Asia, China, India and Pakistan, have established a “triangular” dilemma due to their security concerns. This is manifested through the development of advanced conventional and nuclear weapon forces. China is pursuing a military modernisation program to counter the US in the Asia-Pacific region, whereas India’s development of sophisticated strategic forces is aimed towards China and Pakistan. Their acquisition and development of such deterrents of conventional and nuclear forces is a matter of concern for Pakistan and Chinese security planners. In response, it is inevitable for Pakistan to take measures for its security and safety. Such dynamics have helped establish a multifaceted security trilemma between the three Asian nuclear weapon states, due to which induction and introduction of any technology in conventional and strategic forces of one state is a matter of security concern for other state. This is expressed through India’s offensive policies in pursuit of global power projection, and such dynamics have the ability to disturb the deterrence equilibrium and strategic stability of the region. In this regard, the recent test launch of Agni V demonstrates that India aims to establish credible strategic forces against China, which would not justify its claim of taking a ‘minimalist’ approach against Pakistan. Trends in India’s missile testing and acquisition in nuclear technologies demonstrates that India is largely supported in its quest of strategic forces modernisation by the states, including United States, France, Russia and other European states. In the SIPRI report of 2018, India is ranked as the largest arms importer of the world and its technological transfer and foreign acquisitions are running in parallel with its motivation to increase the range, payload, reliability and accuracy of missiles, ICBMs, MIRVs, SLBMs and development of space program. The United States is supporting India’s military developments for its own strategic, economic, political and military goals for the strategic landscape of Asia. Since the US is supporting India as a Great power in South Asia, India has been attempting to prove its conventional and nuclear credentials. Therefore, such aspirations demand from India to obtain more resilient and disastrous military muscles. Therefore, India’s missile inventory, especially the canister launch of Indian ICBM Agni-V, has played a key role in soothing India’s self-image of a regional power and strategic objective of US. Moreover, its operational launch has the ability to increase security dilemma in South Asia, as well as in the whole region, as its range makes its capable of reaching neighbouring states Pakistan and China, as well as the Asian continent as a whole, along with parts of Europe and Africa. On January 18, 2018 first “Pre-induction” successful test of Agni-V was conducted. Agni V is a three stages, solid fuelled, intercontinental ballistic missile (ICBM). The range of the Agni V is 5,500-5,800 KM and it is capable of carrying a warhead of 1,500 Kg. Later in June 2018, the canister-launch test of Agni V was carried out. The canister-launch version of the missile enables the quick transport of the missile and provides the capability to launch it anywhere. 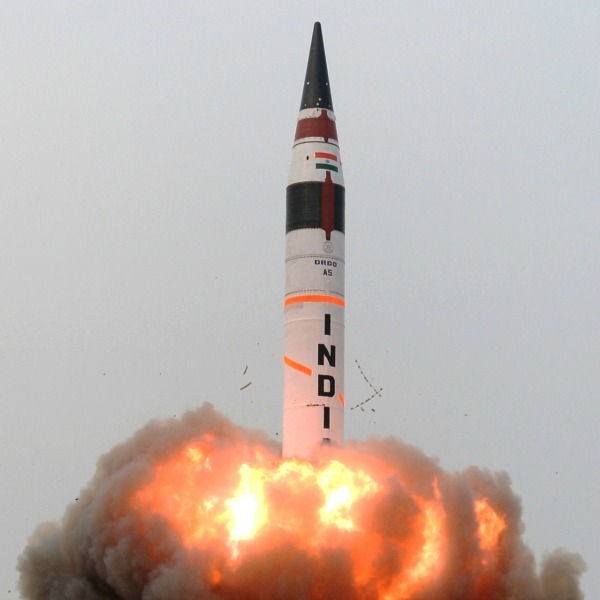 Canister launch of the Agni-V will lower the nuclear threshold in the region and increase the crisis instability. Consequently, according to the report, India is working to incorporate MIRVs technology with Agni V for its credible second-strike capability. The objective of the first three nuclear missiles (Agni-I, Agni II, Agni III) was to counter Pakistan, whereas the other missiles of the series (Agni-IV, Agni-V) are capable of targeting China, due to their increased ranges. The successful canister launch test of Agni V demonstrates that the nuclear capable missile will soon be inducted into Indian Strategic nuclear command. The Canister-launch of the Agni-V will reduce launch times, and pairing it with MIRV technology will have a destabilising effect on the deterrence and strategic balance of Asia. The induction and introduction of operation ready Agni-V will have serious repercussions for geostrategic landscape of the region. India’s latest developments and missile proliferation indicates the country’s shift to acquire more offensive capabilities. Presently, their focus is on increasing the range of its missiles and shift from liquid to solid fuelled missiles, to enhance the level of readiness, and tri-service operation, of nuclear-tipped missile. These developments are providing pre-emptive capabilities to the nation that is inconsistent with their nuclear posture of “Credible Minimum Deterrence”. India’s offensive, conventional and missile capabilities deterrence stability negatively influence the security architecture of the region. Therefore, canister launch of Agni-V; marked by advance range, accuracy, payload and higher level of readiness has not only worsened the security dilemma and instability in the region but it is also threatening its’ neighbouring states with its military build-up.